Asuka is new to ETIB and just started her residency. 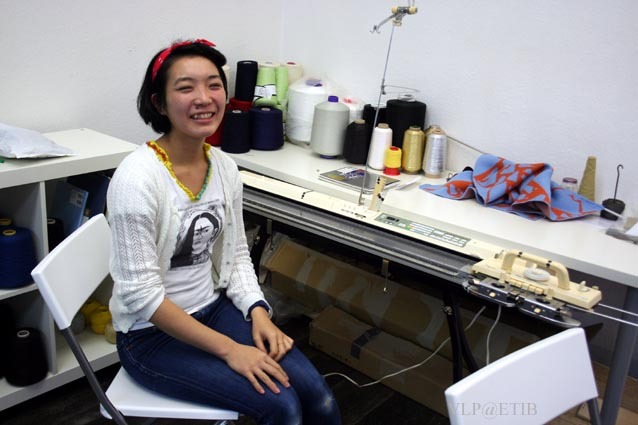 She is from Japan, actually Nagoya which used to have a Brother knitting machine factory! She took knitting machine courses in Brighton and has a great collection of samples. When she came to germany she first worked as au-pair in southern germany and is now in Berlin not only working but also doing an internship at Vivian Graf and learning how to hack and code her brother knitting machine kh 940 (being taught by our wonderful Fabienne). Your energy and enthusiasm are infectious. I am looking forward to your exhibition and future works!